The southern entrance to the Ocala National Forest is about 10 miles north of Mount Dora near the City of Umatilla. The Ocala National Forest is a playground for naturalists, campers, fishermen, hikers and off-road enthusiasts. Covering 383,000 square acres, it contains a 100 miles of horse trails, 67 miles of scenic hiking trails and dozens of crystal clear spring-fed lakes and ponds. Sections of the Ocala National Forest are open to off-road vehicles. This is one of the best motorcycle / ATV areas in the state. There are hundreds of miles of trails within the designated areas. The U.S. Forestry Service - a segment of the U.S. Department of Agriculture - controls activities within the forest. Unlicensed Vehicles are not permitted on improved roads and a spark arrestor is required. Some areas are off-limits in order to protect endangered species. Information on which areas are off-limits can be obtained from forest rangers, who will gladly give you a map showing these areas. 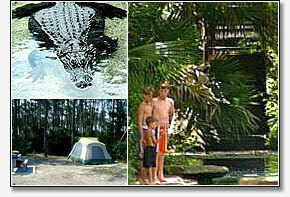 One of the most popular family visitation sites in the Forest is Juniper Springs National Park. Juniper Springs is the site of an old mill where you can swim in a natural spring. The seven-mile canoe run from Juniper Springs is one of the best canoeing opportunities in central Florida. The canopied creek winds through dense, primeval forests that seem untouched by man ? on weekdays, anyway. Come early in the morning and you'll paddle through dappled light that filters through the trees down into crystalline water. The forest is dotted with crystal clear spring-fed lakes, most of which offer fishing in these pristine waters. Picnic areas are numerous and the many forest trails are a nature lovers delight.